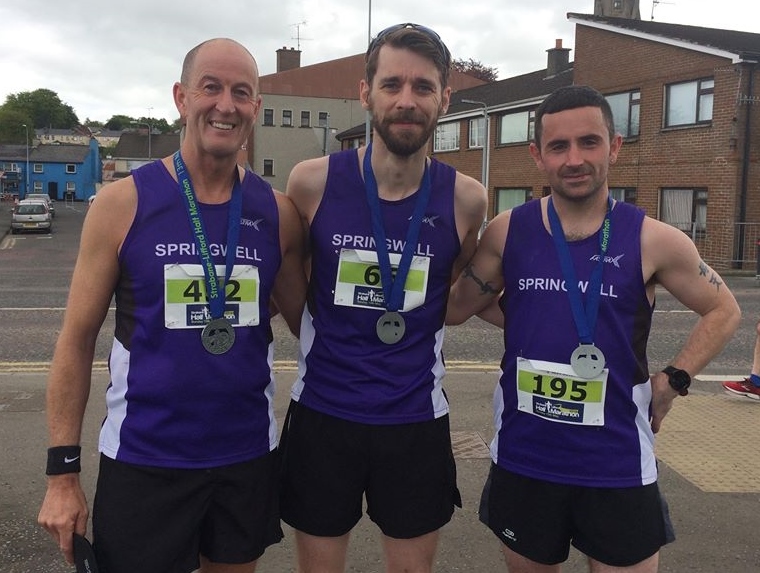 It’s been a very busy week for Springwell RC with members running in events in Belfast, Gulladuff, Newcastle, Strabane, Bristol, Milton Keynes and Stranorlar. The Mayday bank holiday saw the traditional Belfast City Marathon with 17,000 runners taking to the city streets for the Marathon and associated relay race. The day’s event was overshadowed by the tragic death of Limavady man, Stephen Heaney who collapsed on the Sydenham bypass and Springwell RC would like to offer their condolences to Stephen’s family and friends. The race was dominated by the Kenyan athletes with Eric Koech winning the mens event in 2.18.19 and Caroline Jepchirchir won the ladies race in 2.41.23. As always Springwell RC were well represented at the event and even had four of our members assisting the masses by providing pacing. 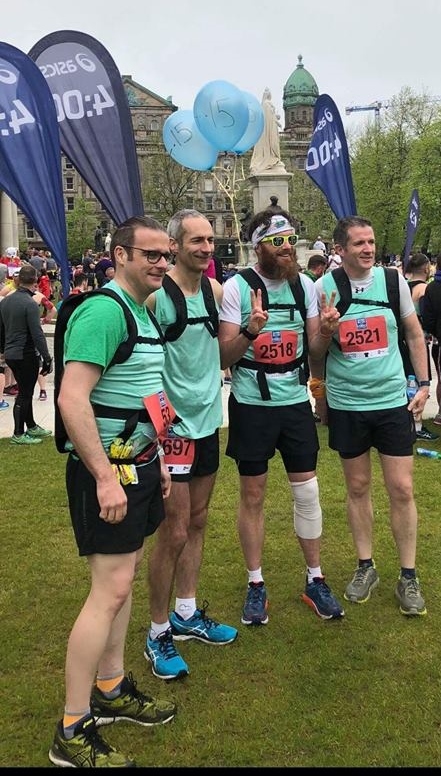 Darren Walsh, Chris Denton, Ali Shaw and John Butcher brought their combined experience of over 200 marathons to assist runners in achieving their targets. In the relay race Springwell RC had nine teams taking part, 8 based on a Wacky Races theme. The Milton Keynes Half Marathon was also on the Bank Holiday Monday and took place in very hot conditions. Representing Springwell RC were Catherine Bell – Allen and Dave King who finished 833rd and 834th respectively in a time of 2.03.10. 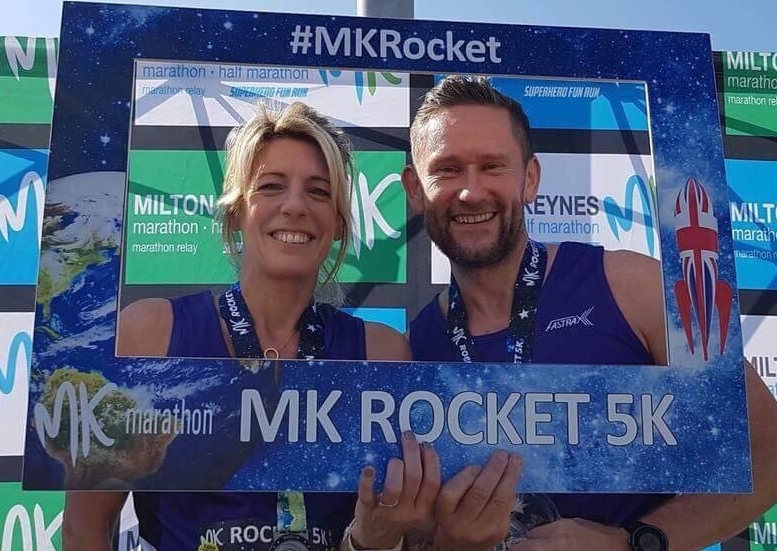 As preparation for the Half Marathon they had taken part in the Rocket 5k on Sunday 6th May where Dave finished 477th in 24.41 and Catherine 480th in 24.44. Nearly 300 athletes turned out on Friday 11th May for the very popular Termoneeny 10k road race hosted by Termoneeny Running Club. The rain and strong winds of the day gave way to perfect running conditions for the event which made for an excellent nights racing. Keith Shiels (Foyle Valley AC) led from the start and claimed victory in 32.08 edging Eoin Hughes (Acorns AC) into second place in 32.38. Seamus Bradley (unattached) completed the podium in third with a time of 35.16. In the ladies race it was the in-form Gemma McDonald (Ballycastle Runners) who led throughout, winning in a time of 39.12. Grace Carson (Mid Ulster AC) produced a strong finish to claim second in 39.23 with Helena Quinn (Termoneeny RC) taking third in 39.46. Springwell RC had a successful evening with a number of personal bests and age category places. Barry Mullan won the M40 category with Alex Brennan in second while David McGaffin took first place in the M50 category. Springwell RC’s Paul Quinn, Alex Brennan, Alister Jamison, Maurice Walker, Andy Dowey, Barry Mullan and Jimmy Stewart. Sunday 13th May was the 5th cross border Strabane – Lifford Half Marathon. Who knows what problems Brexit negotiations may have for the future of this event, which starts in Strabane and crosses the border into Lifford before following the N15 to cross the border again at Clady Bridge to return to Strabane and finish at the Melvin Complex in the Ballycolman Estate? 2018 saw 942 runners complete the course in bright sunshine with Springwell RC’s Bryan Edgar winning the M50 age category and a number of others claiming personal bests. Saturday 12th May saw the annual Slieve Donard Mountain Race take place in bright sunshine in the Kingdom of Mourne. Starting in Newcastle Main Street, competitors’ race to the top of Northern Irelands highest peak, Slieve Donard (850m) before descending to finish at Donard Park, a total distance of 5.8 miles. Springwell RC’s only representative at the event was Alistair Shaw who finished 113th in a time of 1.33.15. The Donegal Senior Athletics Track & Field took place on Sunday 13th May at the Finn Valley Athletic Centre in Stranorlar. In the 800m Springwell RC’s Jonathan McKee ran a 2.00.20 to take third place while in the 3000m Steven McAlary also claimed a third place finish with a time of 9.14.39. 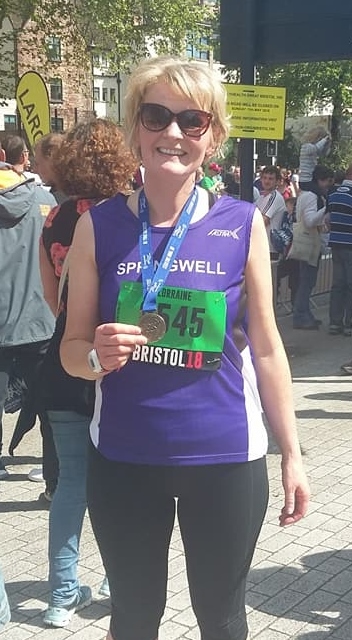 Springwell RC’s Lorraine Abernethy joined over 12,000 runners to take part in the Simplyhealth Great Bristol 10k on Sunday 13th May. Despite starting at 9.15am runners were faced with balmy conditions as the early morning temperatures quickly reached 16c. Lorraine finished in 8060th with a time of 1.06.33.